If you are like us, a good bike ride can make your day. Getting outside, exploring, and having some sun on your face are all part of what we define as a great ride. One of the problems with cycling, though, is that when the weather gets bad, conditions can keep you off the road or trail. That is where bike trainers come in. Maybe it is raining or is too windy outside, or perhaps you need to avoid rush hour traffic or an unsafe dusk ride. This is when you just mount your bike on a bike trainer and get the exercise that you want, but at home. In fact, if done correctly, workouts on a trainer can be some of the best workouts you get anywhere, and will help you stay on your tri training plan even when cold, rain, or darkness aren’t conducive to it. 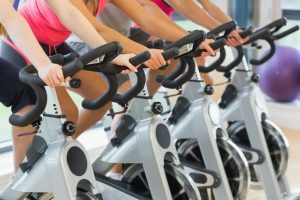 If you have a plan for your 45 or 60 minutes of spinning, it can be just like going to a hard spin class. Riding on a trainer often gets a bad rap. It can be boring, you don’t get the excitement of moving outdoors, and sometimes it is just nice to get out of the house. But trainer workouts can be intense, and give you some of the best cardio work you get all year. In fact, the NIH has found that after 12 weeks of high-intensity cycling training, a measurable improvement in overall cycling efficiency occurs in most cyclist. Start your outdoor season off with a good indoor base, and you will be feeling good by the time you get to your first race. The bottom line is that high-intensity interval bike training works, so if you are looking to get faster in your cycling, incorporating trainer workouts into your season is critical. A bike trainer is typically made up of a frame, a clamp with which the bike is held securely, a roller that is pressed up against the back wheel, and a mechanism (whichever sort it may be) that is used to provide resistance (the exception being a more expensive “direct-drive” version, described further below). The bike you plan to use is mounted onto the trainer so you can experience a workout comparable to an outdoor ride, just in a highly-controlled environment. 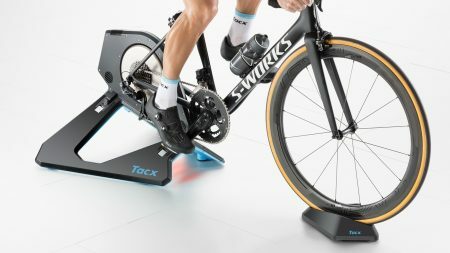 The smart trainers, which are a higher-end version of the traditional bike trainers, are typically direct-drive (meaning you take your rear wheel off and just hook the bike right up to the trainer). These require just a bit more research, so we did a piece on them here. 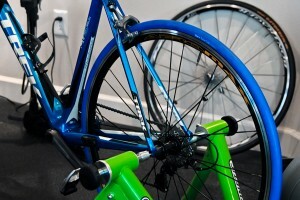 Some people use bike trainers for practice before triathlons or other cycling races, whereas others tend to use it as a substitute for riding outside if the weather is unfavorable. Either way, a bike trainer can provide a high quality workout, and in many cases providers the rider with a more difficult and challenging ride, than riding outdoors. Something that fits your budget. This one is a no-brainer. You obviously need to purchase something that you can accommodate within your budget, no matter how appealing a $900 bike trainer might seem to be. The quality of your workout will more be determined by how hard you work than how much you spent on the trainer. Direct-drive trainers tend to be quieter to operate. apartment with two roommates, you might need to opt for quiet. If you have a nice workout room that is relatively secluded, your options might be more. Many bike trainers are now advertised with a decibel reading, so you can compare one against another. Durability. If you are going to be riding long distance or doing intense workouts, don’t skimp on the bike trainer. As can be said with many types of workout gear, sometimes spending a little more on quality at first results in spending less in the long run. We have used some well-made trainers for several years with virtually no maintenance required. In cycling circles, it is often noted that the first thing to go is the fluid seal, and you get a fluid leak from a traditional trainer. We haven’t had it happen to us, though, and have had good success with our Kinetic and CycleOps trainers. Compatibility with your Bike. This is usually not going to be an issue with most road, tri, and even mountain bikes, but it is good to be sure that the trainer and your bike will work well together. We would say that 90% of road and tri bikes will work well with the trainer — the only issue is if your frame design has some type of fancy feature, especially on rear-most part of your frame and the rear dropout area. Note that some bike manufacturers say that you void the warranty if you break a carbon fiber frame while using a trainer. We have used carbon fiber bikes on trainers for years with no problems — but it is something to keep in mind if you have an uber expensive bike, or if you are a much heavier-than-normal rider. If you plan to use the trainer with any type of power meter, do a little checking to make sure they will work together. They probably will, if both components have been made in the past 3 years. Technology. For many years, a bike trainer was a pretty simple piece of equipment with a roller, a way to clamp in your bike, and not much else. More and more, however, trainers and spinners are becoming “smart” much like everything else is (we did an entire piece on that, here). That means you can buy trainers with a built-in powermeter, or that can integrate with streamed workouts from paid online services. Getting this technology will double your price, but for the right person it could be worth it. This review is primarily about the standalone, non-smart trainers (but of course they can be used with streaming videos, they just don’t integrate the same way) although we did include the Wahoo Kickr which is in the smart lineup. The world of smart trainers is so involved that we decided not to clutter this piece with all of that info, but be sure to check out our article devote to Smart Trainers and Apps. $$$ – moderately priced. Find Here. 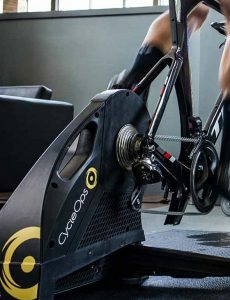 CycleOps is one of the leading bike trainer manufacturers in the world, with trainers being best sellers in the United States as well as being acclaimed by critics. One of their best sellers is the CycleOps Fluid2 Indoor Trainer that has garnered CycleOps a lot of respect, recognition, and revenue. We can speak from experience, the Fluid 2 works and lasts a long time. Though the price point may be a bit daunting at first, users claim that it is worth every penny you spend. This particular trainer features a state of the art fluid resistance mechanism that makes riding a bike on this trainer a very ‘road-like’ experience, and also allows for a lot less noise. For professional and avid cyclists, bike trainers are boring and fake because of how stationary and unrealistic the riding experience is. With this one, however, the trainer offers a road like an experience to make it far more real and a lot more interesting. This allows for better practice as well. Buying this trainer as part of a kit will give you the climbing block for your front tire as well as a sweat mat to put under the bike. The CycleOps works well with both road (or tri) and mountain bike designs, but by far the best setup is with a road bike outfitted with a slick or trainer rear tire. The adjustable foot pads, the hydraulic fluid used in the resistance, and the well-made frame all contribute to an excellent riding experience. Find the trainer kit here. $ – Inexpensive. Find here. The Conquer Indoor Bike Trainer Portable Exercise Bicycle Magnetic Stand is a breath of fresh air considering the affordable price tag attached to it. However, the price is not indicative of its performance in any way. Not only is it very easy to set up, but it is also extremely easy to operate as well. Considering that it does not take up much space, it can be used inside an exercise room, a gym, or even in your garage. Adding to that the fact that it can be folded, this trainer is great for those who need more space and cannot allow for a bike trainer to take up a lot of it. The heavy duty frame, the sturdiness of the construction, the overall stable riding experience, and the unbelievably affordable price tag make this one of the best on the market, especially for beginners. Note — this is not for people who plan to do serious offseason training — it is more for those who want the occasional indoor ride. If you are doing intense workouts where you will be ripping up your frame on hard indoor rides, though, you might want to go with one of our other options. Find the Conquer here. 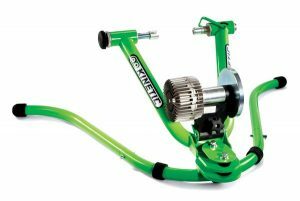 Saving the most expensive for last, this trainer is specifically for those who can justify spending over a thousand dollars on a bike trainer. It falls into the category of smart trainers, where the going price starts at $600 and can go all the way up to $1,500 or more. Considering the features that it comes with, the price tag can be justified. This is a direct-drive trainer with smart technology, a couple game changers in one if you have never used one. The direct-drive feature is nice because it removes the variability of tire pressure on the overall power transfer, and it also allows you to not worry about using a trainer tire while riding. You literally just pop the rear wheel off, and hook your chain directly in to the unit while mounting on the trainer. The smart features are intended for those who plan to use the unit with an app like Zwift or Spinervals. We have ridden all of the smart trainers out there — Cyclelops, Wahoo, etc. Of the bunch, the Tacx is the quietest. That is nice, because with a direct drive smart trainer, the flywheel apparatus can create a hum or a whine at higher RPM. It can be annoying, and probably not terribly good for your hearing. The Tacx is impressively quiet – even silent at times. With a smart trainer like the Neo 2, you get a built-in ability to monitor your pedal stroke and power. A power meter by itself would normally cost $600 or more to put on your bike if you did it standalone. Tacx provides software that users can use to manage and guide their rides, but since the Neo 2 is compatible with virtually all the smart cycling apps on the market, we suggest you just go with one of those. This is a substantial investment, but worth it. We would put the Cycleops H2 as our second choice, but it is a bit louder. The Wahoo Kickr is another popular option, but we have read about enough reliability issues with the newer version so we are steering clear for a bit and monitoring the situation. Find the Neo 2 here. Should I Get a Smart Trainer? We did an entire piece on smart trainers, here. One of the most common questions we are getting now is if people should get a smart trainer or a regular trainer. Our answer is usually the same: Make sure you get a good quality trainer of some sort, because even a non-smart trainer will do wonders do your indoor and offseason training and fitness. From there, think about how important the community is to you, as well as how much you are already planning to spend. If you are already going to spend $500 or more, consider just moving up to the smart trainer functionality so you have that ability if you want it. If you are someone who really values riding as part of a virtual group or an interactive class, you will want the smart technology. Otherwise, we can tell you that we have been happy for years — actually for a decade — with our regular trainer workouts coupled with the right workout videos for inspiration. One important note – setting up a smart trainer is quite a bit more involved than a traditional trainer. With a traditional trainer, you take it out of the box, stick your bike on the trainer, clamp it in, put your front wheel on a block, and go. With a smart trainer, you are likely removing the wheel and maybe even the cartridge, putting a cartridge on the smart trainer, plugging everything in, and then syncing the trainer to whichever app you are using. If you want something that is really easy to plug-and-play on a random rainy day, a traditional trainer might actually be more your speed. A trainer tire can withstand the friction of a traditional trainer. Training videos. In our opinion, these are indispensable and the reason you get a trainer. There are several series of Cycling DVDs out there that will help you get the most out of our workouts. Having a focused training session will turn your trainer session into a spin class. Done right, these will be incredible workouts. You can usually find ones that are anywhere from 30 minutes to more than 90 minutes long, and they can either be in DVD form or streamed to a device or TV. We recommend having at least 5-6 to choose from, as your available time and desired intensity will vary from day to day. Our favorites tend to be the Spinervals series. Tire block. Many trainers will come with a front tire block, but some won’t, especially if you get one used. A block is key, because without it the rear tire will sit much higher than the front. If you have the option of a new trainer with a kit, always do the kit — that means it includes the block and other accessories. A mat can be useful under your bike, especially if you are doing workouts that will cause you to sweat. Most mats will run between $35 and $50. The sweat, over time, can damage some floors if you don’t promptly wipe it up – and after an intense workout, trust us when we say wiping up a pool of sweat is not going to be top of mind. Mats are not rocket science — just get one that will serve the purpose, and don’t overthink it. Trainer tire. The problem with using your bike on a trainer is that it can really wear out a tire. The friction of a tire on the trainer creates a lot of heat,which reduces the life of the rubber on a typical road bike tire. That is why we recommend using a trainer tire for about $35. 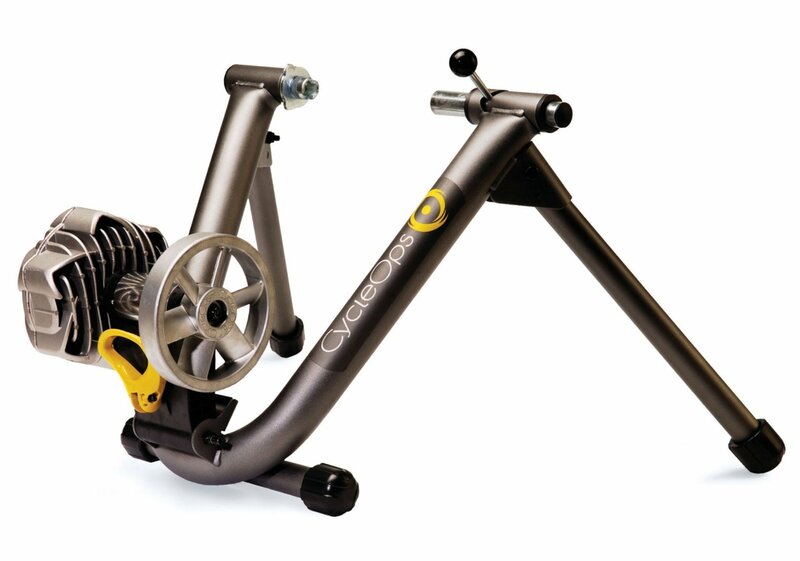 It can withstand the heat and friction created by a traditional bike trainer. We like to have a spire rim, cassette, and tire at the ready for a fast swap when we want to go on the trainer. 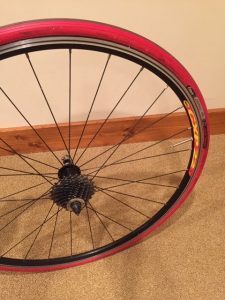 Spare rim, cassette, and skewer (optional). We often just mount it on an old, used rim and swap the whole wheel out each time we move the unit on or off the trainer. This makes it easy to do a 5-minute change if you see that the weather is bad, or change your mind and decide to run outside. It is much simpler (and cleaner) than the 10-15 minute process of putting the right tire on your rim. With the options being so different from each other, definitely do your research and be sure that your purchase fits your needs. The four we listed above are all ones that we would stand behind. A bike trainer, if used appropriately and regularly, can be worth every penny you spend. After all, you are training on your exact bike, getting used to the saddle, angle, and all of its components, rather than having to get the feel for one bike in the summer and another in the winter. If you are anything like us, you will get to the point where you crave some of your tough trainer workouts in the winter. If You Found This Useful….. Check out some of our other, recent cycling-related articles.